An unbelievably moist cake that’s loaded with chunks of tart apples and crunchy pecans. Once you have your first slice, you’ll be begging for more! 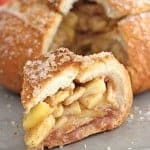 When it comes to baking with apples, my family has three go-to recipes that we love to make and are always a hit at family gatherings. I have already shared my Mom’s Special Apple Pie with you. I am about to share my Great Aunt Ruthie’s Fresh Apple Cake. And stay tuned because I will be sharing my Great Aunt Ina’s Apple Dumplings in the coming weeks. I honestly don’t know what I would do if all three were on the dessert table at once. Just kidding, I would without a doubt have a generous serving of all three! 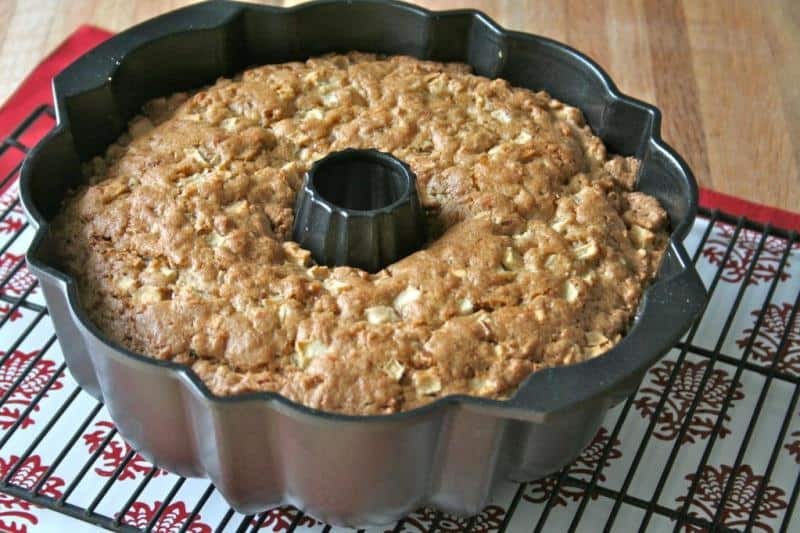 I can’t remember a time when I showed up at my Great Aunt Ruthie’s house and there wasn’t a Fresh Apple Cake in the cake stand on the kitchen counter. It is like a decoration in her kitchen except for she probably has to bake one every other day given how fast we “kids” can devour it. This unbelievably moist cake is loaded with chunks of tart apples and crunchy pecans. Once you have your first slice you will be begging for seconds. It’s a big cake that’s simple to make. 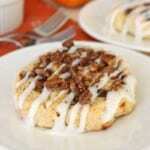 Full of fresh apples, sweet coconut and crunchy pecans making it a fabulous fall dessert. So fresh and so fabulous! This post was created as part of my partnership with Gold Medal Flour however thoughts and opinions are certainly my own! An unbelievably moist cake that's loaded with chunks of tart apples and crunchy pecans. Once you have your first slice, you'll be begging for more! In the bowl of an electric mixer fitted with the paddle attachment, beat together the oil and sugar. Add the eggs and vanilla and beat until well combined. With the mixer on low speed, add in the flour, baking soda, salt, nutmeg and cinnamon until well combined. 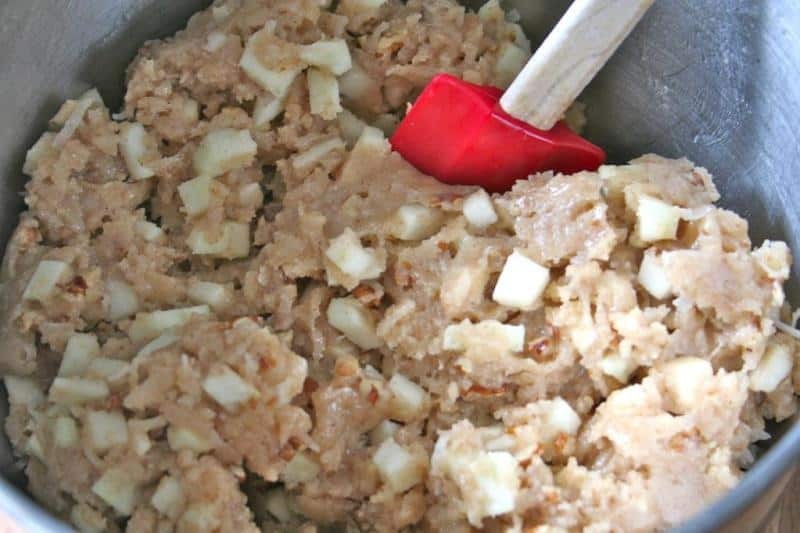 Fold in the pecans, coconut and apples. Batter will be thick. Spread batter evenly into prepared cake pan and bake for 60-65 minutes or until a long wooden pick or knife inserted in the center comes out clean. Let cake cool in pan on a wire rack for 15 minutes. Invert pan on wire rack until cake drops out. You might want to tap the bottom of the pan with a knife a few times to loosen the cake and make sure it came out in one piece. Slice and enjoy! It was sooooo good! Thank you for this recipe, it’s definitely a keeper. Fresh Apple cake . You don’t indicate if you use the mixer to beat the ingredients or just hand mix ??? Hi Priya! Yes, you use the mixer to beat the ingredients together. I’ll reword the instructions to make it more clear. Thanks for checking. Enjoy! Can I omit the coconut? My husband dislikes it…. Hi Jor! Yes, you can omit it. Enjoy! My son is getting married and we have to feed a group of people before and after the wedding. Can you make this ahead and freeze? Because it is a great recipe. I noticed the batter is very dry and sticky. Is this how it is suppose to be. Hi Marcela! The batter should not be dry or sticky. It should be very moist yet thick. Did you follow the recipe ingredients exactly? I have made a similar version for many years but my recipe calls for mixing the batter by hand after beating oil, sugar, vanilla and eggs together and you don’t add coconuts or nuts. The oil is what makes it so moist. I had a similar problem though with your recipe with the batter being crumbly. I tossed the batter and remade using my mixing instructions and your recipe is just as delicious with the batter nice and thick but not crumbly. If anyone has this problem they might try this. I also bake it at 350. Wait…is this your aunt’s recipe or created as part of your partnership? i tried to make it and it about killed my KitchenAid mixer, so I read back through the post and noticed this discrepancy. Disappointed. Hi Sam! This is my aunt’s recipe and I posted it as part of my partnership with Gold Medal Flour. I hope that clarifies for you. 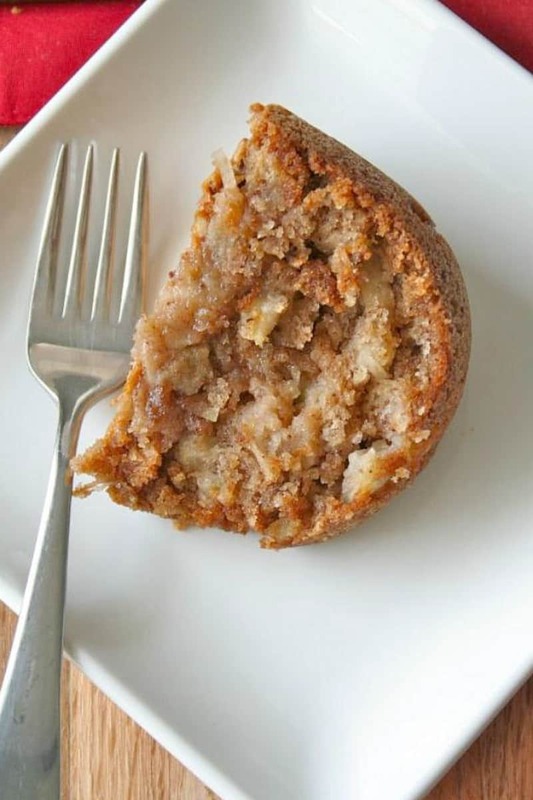 🙂 It is a thick cake batter, but a KitchenAid mixer should definitely be able to mix it easily and then you fold in the pecans, coconut and apple. Did you follow the ingredients exactly? I’m sorry you had trouble with it. My grandmother would make this cake when I was younger. Now I have been making this for years. I love it. can this be made in a 9×13 instead and if so for how long? Hi Diane! Yes, it can. Just start checking the cake every 5 minutes after it’s baked for about 40 minutes. 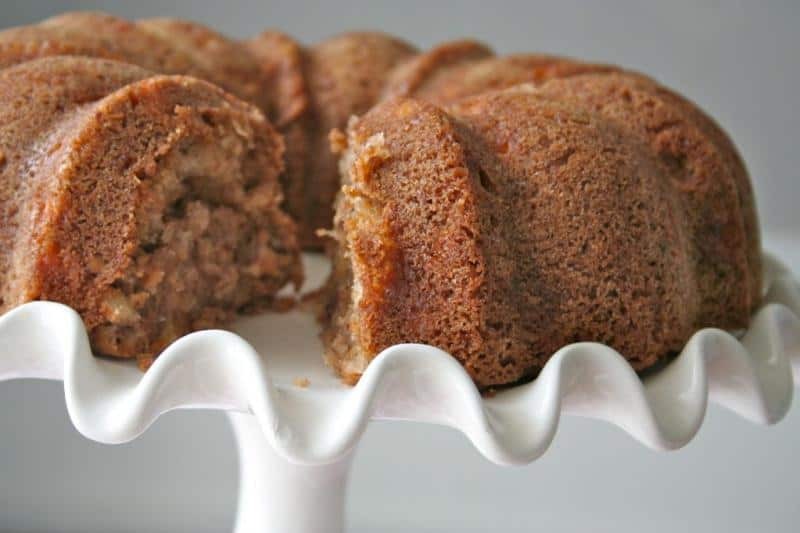 It probably won’t take an hour to bake like the bundt does. Enjoy! Can you substitute walnuts for peacans? Hi Wendy! Yes, I think walnuts would taste great in this cake too. Enjoy! It’s baking in the oven now but the batter was very thick. Is there any liquid missing from the ingredients? I’m hoping the juice from the apples is what makes it moisten in the oven as it bakes. So far, not sure about this recipe (I followed it to the letter). The batter should be thick and moist (see pic in post). How did it turn out? This sounds delicious! I can not wait to try it. 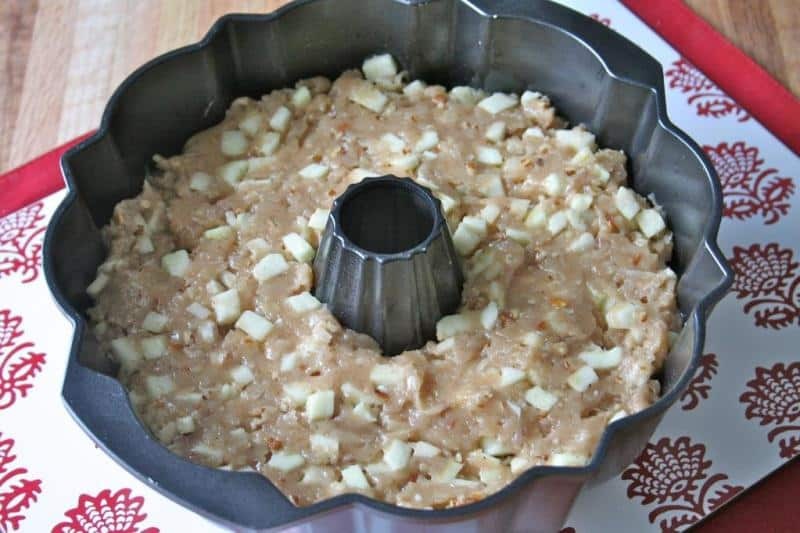 I think it will make a great cake for my mom’s birthday next month, she loves apple desserts. I made this cake exactly as stated. The batter was perfect, but 325 was too low a temp. It was still incredibly undercooked. I’m at a very low elevation. Should/can I do this at 350 for the same amount of time? Hi Aleshia! Yes, you can bake it at 350, but if it starts to brown too much on the top as it’s baking, I would cover it with foil and let it continue to bake until the middle is done. I’m so glad you baked and loved it, Judy! It’s a family fave, especially in the fall. Perfect for Thanksgiving! Hi! I was wondering if these could work as cupcakes? And if so, around how many would it make? Hi Gabby! I haven’t baked this recipe into cupcakes yet, but I think they would turn out great. The baking temperature will be the same, but the time will be reduced…maybe start checking after 15-20 minutes. I’m guessing it would make 14-18 cupcakes. Enjoy! I made this today and it’s DEEElish! 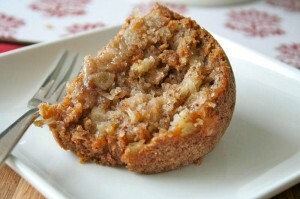 It was a very thick batter and I worried if I folded the nuts, coconut, and apples in evenly, but it turned out fine. I also thought about making a glaze for it, but after trying out a slice, realized it was perfect as is! Loved the recipe. So glad I stumbled upon it on Pinterest. Happy baking! Revision: The batter is crmbly, but it sticks together if you press it. It tastes fine, except it tastes like it has a lot like oil. I’m at a high altitude, but I’m not sure if that would make a difference. Hi Saige! 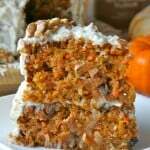 The shredded coconut is a necessary addition and contributes to the texture of the cake. It adds a lot of moisture. The pecans can be left out. Thank you! Unfortunately, I don’t have any coconut, so I added a little water to make it stick together more. It’s almost done cooking now, and it looks fine, but I’ll just have to see how it tastes! Thanks again! I had some apples that I needed to use up. I did a quick Pinterest search and came across this cake recipe. I will definitely be making this again. I made mine in mini bundt cake pans. About the size of a large muffin. I adjusted the bake time to 40 minutes. They came out perfect. Just the right amount of crunch on the edges and completely soft on the inside. At first I thought I misread the recipe because of how thick the batter is… so if this is you, do not worry. It’s very thick. More like a cookie dough. I also used my mixer dough hook to “fold” in the apples, coconut and pecans. It worked well. Thank you for sharing this amazing recipe! It was definitely a great find! OMG! This cake is simply amazing! I made it for the first time three weeks ago and have made three more since then. It’s hard to keep this dessert around for very long. So delicious! Thank you! I made this cake, smells delicious, I have a gas oven and had to cook an additional 20 minutes, to the 60 minutes I had originally put the cake in for . Can’t wait to taste test it . This cake is amazing!! I cannot keep it around for more than two days. In the last 8 weeks I’ve made six of them and have had five people ask for the recipe. I’m going to try making it into cupcakes this weekend. This is simply amazing! Thank you for sharing it. I made this cake last fall and it was so great I’m making it for my birthday soon. However, I feel like the first time I made this there was a sauce you poured over it in the pan while cooling? Am I thinking of another recipe or did you change it? My 5 year old picked this cake on, Pinterest, for his 5th birthday get together with family. It was a big hit. I did add a maple glaze to up the pretty factor since it was for a birthday. 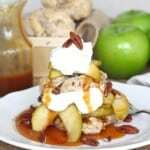 I just recently made it with half apples/half pears since I had some I needed to use up. The pears were pretty soft so I ended up baking it for an extra 10 minutes so that it wasn’t undercooked in the center. 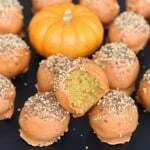 Do you think the recipe would work with whole wheat flour? Thanks for the recipe it is now one of our favorites. Thank you for the recipe, my family loves it! I have an apple tree and wanted to make several cakes and freeze. Has anyone ever frozen the cake? Let me know, I may be trying it anyway! Hi Elaine! I love that you have an apple tree! I would love to have one! Yes, you can definitely bake and freeze this cake. Just let it cool completely and then wrap it twice in plastic wrap and then in foil before placing in the freezer to lock in the moisture and prevent freezer burn. Unwrap the cake before defrosting. Enjoy! This makes me happy! I’ve never seen anyone make this outside my family! This is exactly like my late mother’s recipe! Looked forward to her Fresh Apple Cake every fall! I’ve carried on the tradition ❤ Hope everyone tries this delicious recipe. Thanks for helping me recall some very happy childhood memories! We moved to the mountains in WNCthis past January and I’m still trying to remember about higher elevation baking. I have this cake inn the oven now, how much longer do I need to let it go to compensate being at 3,000 ft? Hi Shannon! I hope it turned out great! I usually recommend that you increase the baking temperature by 25 degrees and then watch the cake carefully as it nears the end of the recommended baking time. It will probably take longer, but you’ll just have to check it for doneness. Enjoy! Hi Lauren! I’m so sorry to hear it didn’t turn out perfect for you. It sounds like the cake didn’t bake long enough. The batter should be very thick and when baked all the way through you get a moist tender cake as shown in the pictures. Did you test the center of the cake before taking it out of the oven? 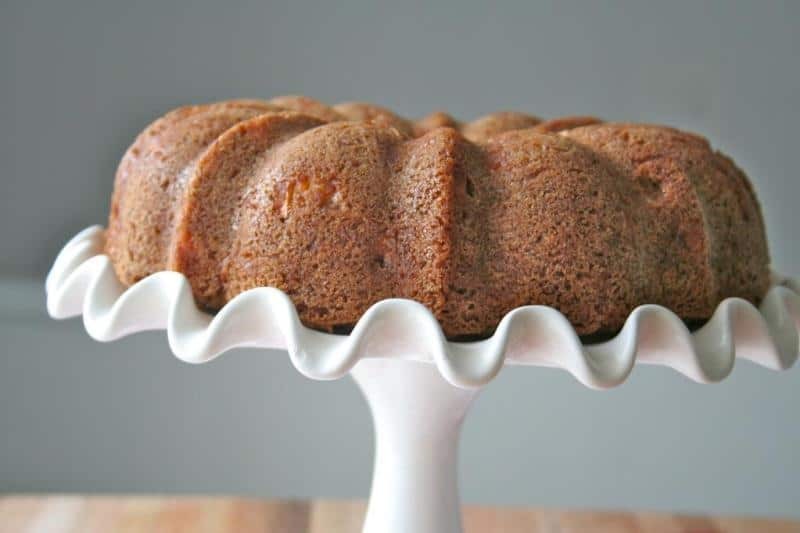 Did you use a bundt pan? It’s an amazing cake so I hope you’re able to give it another try. This is a delicious cake! Made it for my husband’s BD and it was a big hit. I followed the recipe exactly even though I really wanted to reduce the amount of oil. I also thought 325 degrees was not hot enough. But I trusted the recipe and am glad I did! I did have to bake it an hour and twenty minutes. Just checked it every few minutes. Thank you for this recipe. I made this for Thanksgiving and it was unbelievable! I was really worried when the batter was so thick that I had to mix it with my hands, but it turned out amazing! Here’s my adult version: I added a quarter cup of Myer’s dark rum, cooked it in a bundt pan, and it came out perfectly. Afterwards, I combined some rum, brown sugar and butter in a sauce pan, then poured the hot liquid over the warm cake. I let it cool completely, turned it over onto a plate, and served it up. My coworkers loved it! Today, I’m making them as cupcakes, but instead of the buttered rum glaze, I’m making a rum-butter cream frosting to top them. I made this cake for our Family Christmas dinner. The batter came out so stiff, I had to fold the apples and nuts ( I omitted the coconut.) into it with my hands. I then pressed it into the bundt pan and leveled it off. I was pretty sure I had messed up on something but I decided I had nothing to lose. When the cake was baked and I turned it out onto the cooling rack, it developed several cracks. At that point, I gave up and made an applesauce cake. Because I didn’t plan to use this one, I cut my husband a piece. He said, “It may look funny, but it’s the best apple cake I’ve ever had! As far as I’m concerned, you can make it the same way next time.” My takeaway from this experience is that you’ll have to try really hard to mess this cake up. Hi Elaine! The batter is super thick and actually the coconut adds a ton of moisture to the cake so leaving that out would make it even thicker. I’m happy to hear your husband loved it. It’s such an amazing cake that you just have to trust the recipe on! Enjoy and thanks for sharing! Hi Cindy! About 3 medium apples chopped will equal 3 cups. Enjoy! Cake is just GREAT ! Cake have a oily taste. Can I put 1 cup ? Hi Helen! You can try reducing the oil, but I’d recommend replacing the amount you reduce it by with applesauce. The batter is already very thick so reducing any liquid ingredient would make it even thicker. Certainly worth a try. Enjoy! A bit of a health nut so use the apples unpelled. The old apple a day thing is very true, b sure to eat the pell. Have had the cake many times, always great, gona try the rum thing next. P.s. Don’t mince the apples, big chunks better. Love it! So happy to hear your changes turned out great. Enjoy! I just made this recipe but i was rely concerned about thr already really thick batter that i omitted the coconut and nuts. I didnt want to lose any moisture from this batter, especially simce Inwas just slightly under on the apple. Its in the oven now, i followed the recipe except i mixed oil and butter together because I read that you get a better tasting cake if you add some butter to an all oil recipe. Also I added an extra tsp. of cinnamon to the apples before mixing them in. Hope it turns out good. Hi Queen! I hope it turned out great for you. Can I use my frozen apples? Hi Viv! Yes, the texture of the apple will be softer, but still tasty. You can either defrost the apples first or bake them from frozen. Enjoy! Cake tastes good. But it just crumbled when I cut it. And when I tried to eat a slice, it just turned into crumbs. Followed the recipe to the letter and cooked in 60 minutes. Oh my goodness! That should definitely not be the case with this cake. It should be very moist yet tender with all the apple, oil and coconut in it. Did you bake it in a bundt pan? And at 325 degrees? I’m wondering if your oven’s temperature it hotter as it sounds like it’s over-baked if you followed all of the ingredients exactly. Hi there. Recipe looks amazing. Was wondering if it can be done in a loaf pan instead of a bundt? If anyone has any comments on this inquiry please respond. Thank you. Hi! Yes, but you would need to divide the batter between two 8-inch or 9-inch loaf pans. And the baking time will be shorter so start checking the cakes around 45 minutes. Enjoy! Thank you. I will try it like this. Hi Annette! This recipe was not created for high altitude baking. You would need to adjust the recipe accordingly. Hope it turns out just as great!